The broadband situation in Scotland has always been a slightly confusing one since many of the contract targets talked about fibre broadband, but this in reality includes lines that may be 3 or 4 km long in terms of copper distance from the fibre enabled cabinet that is injecting the VDSL2 signal. 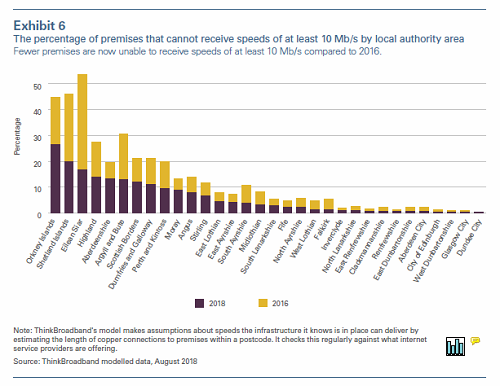 The latest Audit Scotland report on what has been delivered by the Digital Scotland roll-out and some of problems with the Community Broadband Scheme may confuse some with the use of fibre again, but they do make it clear early on what they mean. 5. The Scottish Government’s investment in expanding the fibre broadband network across Scotland is intended to provide access to superfast speeds with improved reliability.3 The term fibre broadband covers all broadband technologies that have a fibre element, including fibre to the cabinet (FTTC) and fibre to the premises (FTTP – also known as full fibre) (Appendix). The BT contracts have delivered which will come as a big suprise to those who have not seen any improvements, but that is the nature of any contract that is not set to deliver 100% coverage and had value for money as a big driver, rather than any means testing for who is to benefit. Some our thinkbroadband data has been used to illustrate the changing broadband landscape in Scotland, with the above chart showing the difference in coverage for a 10 Mbps service in August 2016 versus August 2018. Clearly a lot more to be done in the rural areas and with the existing BDUK roll-outs in Scotland continuing until 2018 and some into 2019 we are going to see further improvements. One observation to make is that almost just like every other BDUK contract BT has had in the final year we are starting to see more FTTP being deployed. The report is less complimentary about the Community Broadband Scheme, citing a lack of specialist skills, delays and failed procurements for not delivering what was originally expected. The most important now is not the past, but the future and the hopes that are attached to the R100 project, but the Auditor General does have some concerns over both the timescale and costs of delivering 100% superfast coverage in Scotland by December 2021. The infographic collates some of the concerns people have had, namely that while the £600 million of funding is a lot larger than any previous BDUK contract, there are premises that may miss out and a lot of this depends on the commercial roll-outs which includes 30,000 premises in urban areas. Another gotcha is there are believed to be some 34,000 premises with a 24 Mbps to 30 Mbps option that are not included in the initial R100 contracts that are due to be awarded in 2019. 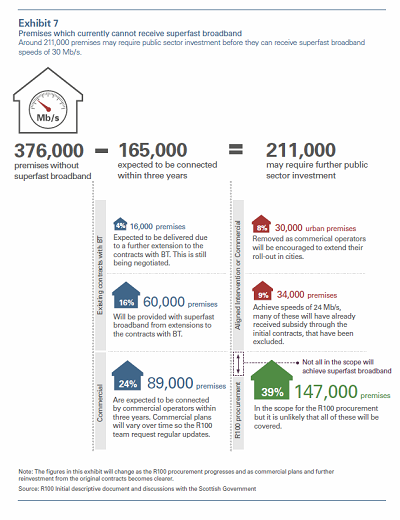 If all 211,000 premises were concentrated into two cities then delivery of 100% superfast in a 3 year period would be considered easy, but the widely dispersed nature of Scotland makes the task a lot more difficult and it is for this reason that there is a chance that we may see wireless technology deployed at levels well beyond any previous contract with a slower roll-out of fixed line technology to follow up and tick any full fibre elements of the contracts. Those in the gap between the two superfast definitions are also most likely to be the ones where due to VDSL2 performance issues may actually only be connecting at 19 Mbps for example even if every other data point suggests that sync speeds of 27 Mbps should be possible. Reasons why this may happen are numerous and range from bad data on the Openreach side through to a VDSL2 on the end of a poor quality phone extension in a home. We are not going to be slowing down our data modelling, in fact the amount of work has actually increased in 2018 compared to 2017, since the amount of ultrafast broadband delivery has increased and modelling all the new cabinets appearing where no infrastructure existed before takes longer. For those looking at our Scottish data set and wondering why the figures do go down occassionally, this is largely down to chunks of new build premises appearing without superfast broadband by default, though in some cases months down the road we do find that something superfast has appeared. A reality we believe is that the R100 project is already a casualty since in the minds of a lot of the public the early announcements were all about delivering 100% superfast coverage by 2021 and while cautions were raised at the time around exclusions the joy of soundbite politics and a vaguely technical subject mean that boring but necessary caveats are all too often missed out and thus the perception is that R100 is a 100% superfast by 1am on 1st January 2021 is probably firmly cemented. Yes that date is right, since for the public when you say by 2021 they think you mean then not the fully qualified version which should be by the end of 2021. 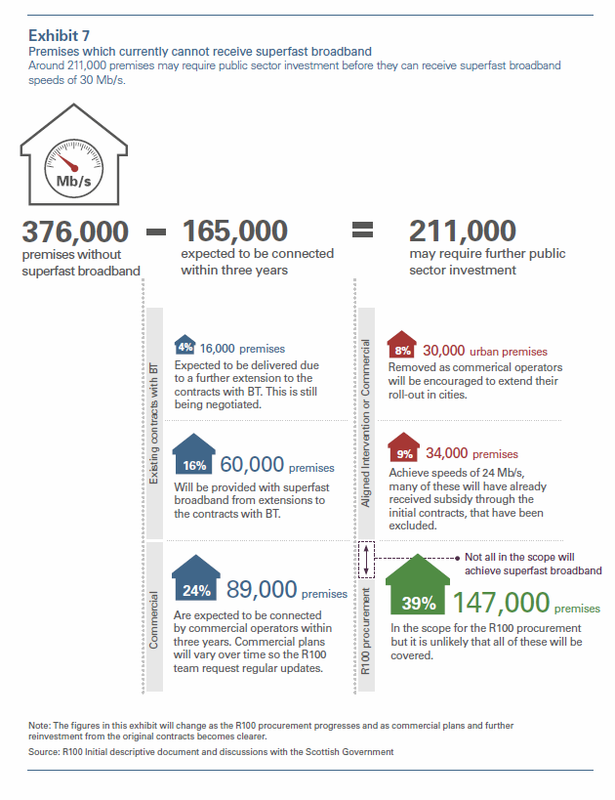 Dare we mention the UK wide ambition of 50% full fibre for 2025 and 100% for 2033, it will be interesting to see what impact this ambition has any of the contracts or extension contracts using public money in the next few years. In theory while there is a lot of gainshare/clawback money lying around, the financial pressures on local authorities mean we expect an increasing number to be eyeing up this money that will come back to them eventually as a key ally in balancing the books in future years, rather than being available to get full fibre broadband to another couple of thousand people. I'm certainly not holding my breath, with the failure of Superfast Scotland to be unable to even supply correct information, there's no reason to believe R100 will actually deliver. I stopped holding my breath a long time ago following Digital Scotlands terrible handling of communication on BDUK. I hope R100 will be better but given BT's recent play on the USO to effectively remove a vast proportion of the target by saying 4G is available to them, I suspect they'll have a similar play on R100. My own exchange (Essendy) and neighbouring exchange (Meikleour) both say end Dec 2018, however not a single hole has been dug for either exchange and neither exchange has any cabinets - everything is EO. Another exchange in the area (Madderty) also shows December, yet their date has been put back no less than SIX times. The whole Digital Scotland thing is a total farce, and both they and Openreach must think that the general public are stupid. We are not. "UK wide ambition of 50% full fibre for 2025 and 100% for 2033"
The chart you publish above showing figures for <10Mbps shrinkage over the past 2 years is very interesting. Are you able to provide more local figures, say for each county in Scotland so that areas of most need can be more accurately mapped and targetted by CPs such as ourselves whose mission it is to address precisely this need? Meanwhile, in the same week that Openreach finally accepted that their enormously damaging decision to carry on with State-subsidised VDSL was wrong (January 2018), CBS advised North Skye Broadband - a not-for-profit community benefit society pursuing a B4RN-style FTTP roll-out and ready to deliver a demonstrator project to 60 premises (including five businesses presently using satellite broadband connections that don't meet their requirements) had its "de minimis" funding offer withdrawn without notice because of the R100 invitation to tender. You just couldn't make this up. "Meanwhile, in the same week that Openreach finally accepted that their enormously damaging decision to carry on with State-subsidised VDSL was wrong (January 2018)..."
Old thread I Know but you only have to look at the Ofcom coverage tool, to lose any hope of R100 actually meeting target. Lots of relatively tiny green patches in the FTTC rollout areas and misery in between. I think many people when they hear the 90% + success story trotted out really don't see the scale of the work to connect the rest, have a look how far FTTC has really penetrated out into rural Scotland. All those red dots aren't remote halfway up a mountain Crofters cottages, as they like to imply with the 'hard to reach', remote or difficult tags.